For other uses, see Hotdog (disambiguation). The hot dog or dog (also spelled hotdog) is a grilled or steamed link-sausage sandwich where the sausage is served in the slit of a partially sliced hot dog bun, a bun of size and shape to hold the sausage. It can also refer to the sausage (the wurst or wörst) of its composition itself. The sausage used is the wiener (Vienna sausage) or frankfurter (also frank). The names of these sausages also commonly refer to their assembled sandwiches. Typical condiments include mustard, ketchup, mayonnaise, and relish, and common garnishes include onions, sauerkraut, chili, cheese, coleslaw, and olives. Hot dog variants include the corn dog and pigs in a blanket. The hot dog's cultural traditions include the Nathan's Hot Dog Eating Contest and the Oscar Mayer Wienermobile. These types of sausages and their sandwiches were culturally imported from Germany and became popular in the United States, where the "hot dog" became a working-class street food sold at hot dog stands and carts. The hot dog became closely associated with baseball and American culture. Hot dog preparation and condiments vary regionally in the US. Although particularly connected with New York City and its cuisine, the hot dog eventually became ubiquitous throughout the US during the 20th century, and emerged as an important part of other regional cuisines, including notably Chicago street cuisine. Claims about the invention of the hot dog are difficult to assess, as different stories assert different origins for the distinction between hot dogs and other similar foods. The history of the dish may begin with the creation of the sausage, with the placing of the sausage on bread or a bun as finger food, with the popularization of the existing dish, or with the application of the name "hot dog" to a sausage and bun combination most commonly used with ketchup or mustard and sometimes relish. The word "frankfurter" comes from Frankfurt, Germany, where pork sausages similar to hot dogs originated. These sausages, Frankfurter Würstchen, were known since the 13th century and given to the people on the event of imperial coronations, starting with the coronation of Maximilian II, Holy Roman Emperor as King. "Wiener" refers to Vienna, Austria, whose German name is "Wien", home to a sausage made of a mixture of pork and beef. Johann Georg Lahner, an 18th/19th century butcher from the Franconian city of Coburg, is said to have brought the Frankfurter Würstchen to Vienna, where he added beef to the mixture and simply called it Frankfurter. Nowadays, in German-speaking countries, except Austria, hot dog sausages are called Wiener or Wiener Würstchen (Würstchen means "little sausage"), in differentiation to the original pork-only mixture from Frankfurt. In Swiss German, it is called Wienerli, while in Austria the terms Frankfurter or Frankfurter Würstel are used. Carts selling frankfurters in New York City, circa 1906. The price is listed as "3 cents each or 2 for 5 cents". Others are credited with first serving hot dogs on rolls. A German immigrant named Feuchtwanger, from Frankfurt, in Hesse, allegedly pioneered the practice in the American midwest; there are several versions of the story with varying details. According to one account, Feuchtwanger's wife proposed the use of a bun in 1880: Feuchtwanger sold hot dogs on the streets of St. Louis, Missouri, and provided gloves to his customers so that they could handle the sausages without burning their hands. Losing money when customers did not return the gloves, Feuchtwanger's wife suggested serving the sausages in a roll instead. In another version, Antoine Feuchtwanger, or Anton Ludwig Feuchtwanger, served sausages in rolls at the World's Fair – either at the 1904 Louisiana Purchase Exposition in St. Louis, or, earlier, at the 1893 World's Columbian Exposition, in Chicago – again, allegedly because the white gloves provided to customers to protect their hands were being kept as souvenirs. Another possible origin for serving the sausages in rolls is the pieman Charles Feltman, at Coney Island in New York City. In 1867 he had a cart made with a stove on which to boil sausages, and a compartment to keep buns fresh in which they were served. In 1871 he leased land to build a permanent restaurant, and the business grew, selling far more than just the "Coney Island Red Hots" as they were known. In 1916, a Polish American employee of Feltman's named Nathan Handwerker was encouraged by Eddie Cantor and Jimmy Durante, both working as waiters/musicians, to go into business in competition with his former employer. Handwerker undercut Feltman's by charging five cents for a hot dog when his former employer was charging ten. At an earlier time in food regulation, when the hot dog was suspect, Handwerker made sure that men wearing surgeon's smocks were seen eating at Nathan's Famous to reassure potential customers. The term dog has been used as a synonym for sausage since the 1800s, with one thought being that it came from accusations that sausage makers used dog meat, starting in at least 1845. 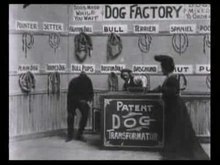 In the early 20th century, consumption of dog meat in Germany was common. The suspicion that sausages contained dog meat was "occasionally justified". An early use of hot dog in reference to sausage-meat appears in the Evansville (Indiana) Daily Courier (September 14, 1884): "even the innocent 'wienerworst' man will be barred from dispensing hot dog on the street corner". It was used to mean a sausage in casing in the Paterson (New Jersey) Daily Press (31 December 1892): "the 'hot dog' was quickly inserted in a gash in a roll". Subsequent uses include the New Brunswick (New Jersey) Daily Times (May 20, 1893), the New York World (May 26, 1893), and the Knoxville (Tennessee) Journal (September 28, 1893). According to a myth, the use of the complete phrase hot dog in reference to sausage was coined by the newspaper cartoonist Thomas Aloysius "Tad" Dorgan around 1900 in a cartoon recording the sale of hot dogs during a New York Giants baseball game at the Polo Grounds. However, Dorgan's earliest usage of hot dog was not in reference to a baseball game at the Polo Grounds, but to a bicycle race at Madison Square Garden, in The New York Evening Journal December 12, 1906, by which time the term hot dog in reference to sausage was already in use. In addition, no copy of the apocryphal cartoon has ever been found. Pork and beef are the traditional meats used in hot dogs. Less expensive hot dogs are often made from chicken or turkey, using low-cost mechanically separated poultry. Typical hot dogs contain sodium, saturated fat and nitrite, which when consumed in excess have been linked to health problems. Changes in meat technology and dietary preferences have led manufacturers to use turkey, chicken, vegetarian meat substitutes, and to lower the salt content. Hot dogs are prepared commercially by mixing the ingredients (meats, spices, binders and fillers) in vats where rapidly moving blades grind and mix the ingredients in the same operation. This mixture is forced through tubes into casings for cooking. Most hot dogs sold in the US are "skinless" rather than "natural casing" sausages. As with most sausages, hot dogs must be in a casing to be cooked. Traditional casing is made from the small intestines of sheep. The products are known as "natural casing" hot dogs or frankfurters. These hot dogs have firmer texture and a "snap" that releases juices and flavor when the product is bitten. Kosher casings are expensive in commercial quantities in the US, so kosher hot dogs are usually skinless or made with reconstituted collagen casings. 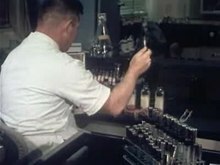 "Skinless" hot dogs must use a casing for cooking, but the casing may be a long tube of thin cellulose that is removed between cooking and packaging, a process invented in Chicago in 1925 by Erwin O. Freund, founder of Visking. 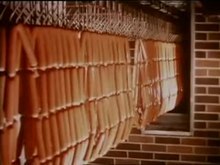 The first skinless hot dog casings were produced by Freund's new company under the name "Nojax", short for "no jackets" and sold to local Chicago sausage makers. Skinless hot dogs vary in surface texture, but have a softer "bite" than with natural casing. Skinless hot dogs are more uniform in shape and size and cheaper to make than natural casing hot dogs. A hot dog sausage is prepared and served in various ways. It is reheated for safety by any means (boiled, grilled, fried, steamed, broiled, baked, microwaved, toasted, etc). Typically it is served in a hot-dog bun with prepared mustard and optional other condiments. The sausage itself may be sliced and added, without bread, to other dishes. Hot dogs are cooked during manufacture and can be eaten as bought, although they are usually warmed before serving. Most hot dogs are high in fat and salt and have preservatives sodium nitrate and nitrite, which are contributors to nitrate-containing chemicals classified as group 1 carcinogens by the World Health Organization, although this has been disputed. These health concerns have resulted in manufacturers offering alternative product lines made from turkey and chicken, and uncured, low-sodium, and "all-natural" franks. Hot dogs have relatively low carcinogenic heterocyclic amines (HCA) levels compared to other types of ready-to-eat meat products, because they are manufactured at low temperatures. An American Institute for Cancer Research (AICR) report found that consuming one daily 50-gram serving of processed meat — about one hot dog — increases long-term risk of colorectal cancer by 20 percent. This is an increase due to eating a hot dog every day of 1.2 percentage points in the probability of contracting colorectal cancer, from 5.8 percent to 7 percent. The AICR's warning campaign has been criticised as "attack ads". The Cancer Project group filed a class-action lawsuit demanding warning labels on packages and at sporting events. Like many foods, hot dogs can cause illness if not heated properly to kill pathogens. An unopened package of franks contains ingredients that have the potential for promoting the growth of Listeria bacteria. Listeria monocytogenes can also cause serious infections in infants and pregnant women, and can be transmitted to an infant in utero or after birth. Adults with suppressed immune systems can also be harmed. Due to their size, shape, and ubiquitous consumption, hot dogs present a significant choking risk, especially for children. A study in the US found that 17% of food-related asphyxiations among children younger than 10 years of age were caused by hot dogs. The risk of choking on a hot dog sausage is eliminated by slicing it. It has been suggested that redesign of size, shape and texture would reduce the risk. In the US, the term "hot dog" refers to both the sausage by itself and the combination of sausage and bun. Many nicknames applying to either have emerged over the years, including frankfurter, frank, wiener, weenie, coney, and red hot. Annually, Americans consume 20 billion hot dogs. Hot dog stands and trucks sell hot dogs at street and highway locations. Wandering hot dog vendors sell their product in baseball parks. At convenience stores, hot dogs are kept heated on rotating grills. 7-Eleven sells the most grilled hot dogs in North America — 100 million annually. Hot dogs are also common on restaurants' children's menus. Hot dogs are commonly served with one or more condiments. In 2005, the US-based National Hot Dog & Sausage Council (part of the American Meat Institute) found mustard to be the most popular, preferred by 32% of respondents; 23% favored ketchup; 17% chili con carne; 9% pickle relish, and 7% onions. Other toppings include sauerkraut, mayonnaise, lettuce, tomato, cheese, and chili peppers. Condiment preferences vary across the U.S.. Southerners showed the strongest preference for chili, while Midwesterners showed the greatest affinity for ketchup. For a list of regional differences in hot dog preparation and condiments, see Hot dog variations. An endless list of hot dog variations has emerged. The original leader, known today as a "New York dog" or "New York style", is a natural-casing all-beef frank topped with sauerkraut and spicy brown mustard, onions optional. Sauteed bell peppers, onions, and potatoes find their way into New Jersey's deep-fried Italian hot dog. In the midwest, the Chicago-style hot dog reigns, served on a poppyseed bun and topped with mustard, fresh tomatoes, onions, "sport peppers", bright green relish, dill pickles, and celery salt. Many variations are named after regions other than the one in which they are popular. Meaty Michigan hot dogs are popular in upstate New York (as are white hots), while beefy Coney Island hot dogs are popular in Michigan. Hot wieners, or weenies, are a staple in Rhode Island where they are sold at restaurants with the misleading name "New York System." Texas hot dogs are spicy variants found in upstate New York and Pennsylvania (and as "all the way dogs" in New Jersey), but not Texas. Some baseball parks have signature hot dogs, such as Dodger Dogs at Dodger Stadium in Los Angeles, and Fenway Franks at Fenway Park in Boston, which are boiled then grilled, and served on a New England-style bun. Skinner's Restaurant, in Lockport, Manitoba is reputed to be Canada's oldest hot dog outlet in continuous operation, founded in 1929, by Jim Skinner Sr. Hotdogs served at Skinners are European style footlongs with natural casings, manufactured by Winnipeg Old Country Sausage in Winnipeg, Manitoba. The Half Moon Drive In, also in Lockport, Manitoba and located directly across the river from Skinners, was established in 1938 by brothers Peter and Louie Kosowicz. The original drive-in consisted of three wooden buildings shaped like semicircles—one was for takeout, one was for dine-in, and the third was a dance hall and later an arcade. The Half Moon also serves European-style wieners manufactured by Winnipeg Old Country Sausage. One of the most popular items is the Moon Dog, consisting of cheese, bacon, fried onions, pickles and mustard, and the Half Moon serves about 2,000 on an average summer weekend day. For a list of international differences in hot dogs, see Hot dog variations. In most of the world, "hot dog" is recognized as a sausage in a bun, but the type varies considerably. The name is often applied to something that would not be described as a hot dog in North America. For example, in New Zealand a "hot dog" is a battered sausage, often on a stick, which is known as a corn dog in North America; an "American hot dog" is the version in a bun. The world's longest hot dog stretched 60 meters. The world's longest hot dog created was 60 meters (197 ft), which rested within a 60.3-meter (198 ft) bun. The hot dog was prepared by Shizuoka Meat Producers for the All-Japan Bread Association, which baked the bun and coordinated the event, including official measurement for the world record. The hot dog and bun were the center of a media event in celebration of the Association's 50th anniversary on August 4, 2006, at the Akasaka Prince Hotel, Tokyo, Japan. On May 31, 2012, Guinness World Records certified the world record for most expensive hot dog at US$145.49. The "California Capitol City Dawg", served at Capitol Dawg in Sacramento, California, features a grilled 460 mm (18 in) all-beef in natural casing frank from Chicago, served on a fresh baked herb and oil focaccia roll, spread with white truffle butter, then grilled. It is topped with a whole grain mustard from France, garlic and herb mayonnaise, sauteed chopped shallots, organic mixed baby greens, maple syrup marinated/fruitwood smoked uncured bacon from New Hampshire, chopped tomato, expensive moose cheese from Sweden, sweetened dried cranberries, basil olive oil/pear-cranberry-coconut balsamic vinaigrette, and ground peppercorn. Proceeds from the sale of each 1.4 kg (3 lb) super dog are donated to the Shriners Hospitals for Children. ^ Brady, William (11 June 1929). "Personal Health Service" (PDF). Amsterdam Evening Recorder. p. 5. ^ "Hot Dogs Chain Store Basis". Los Angeles Times. 11 October 1925. p. 18. ^ Zwilling, Leonard (27 September 1988). "Trail of Hot Dog Leads Back to 1880's". New York Times. p. A34. Retrieved 17 June 2013. ^ "Anniversary of Hot Dog, Bun" (PDF). Binghamton (NY) Sunday Press. 29 November 1964. p. 10D. ^ Lavin, Cheryl (24 September 1980). "Hot dog! 2 mustard moguls who relish their work". Chicago Tribune. p. E1. ^ Hauck-Lawson, Annie; Deutsch, Jonathan (2013). Gastropolis: Food and New York City. Columbia University Press. ISBN 9780231510066. ^ Mercuri, Becky (2007). The Great American Hot Dog Book: Recipes and Side Dishes from Across America. Gibbs Smith. ISBN 9781423600220. ^ Kraig, Bruce; Carroll, Patty (2012-11-20). Man Bites Dog: Hot Dog Culture in America. 2012: AltaMira Press. ISBN 9780759120747. ^ Harper, Douglas. "frankfurter". Online Etymology Dictionary. Retrieved 2009-10-17. ^ Harper, Douglas. "wiener". Online Etymology Dictionary. Retrieved 2009-10-17. ^ KiteFly Web Design – kitefly.com. "Hot Dog History". Hotdogchicagostyle.com. Retrieved 2012-03-05. ^ Allen, Beth; Westmoreland, Susan (ed.) (2004). Good Housekeeping Great American Classics Cookbook. New York: Hearst Books. p. 49. ^ Snodgrass, Mary Ellen (2004). Encyclopedia of Kitchen History. New York: Fitzroy Dearborn. p. 968. ^ McCullough, Edo (1957). Good Old Coney Island: A Sentimental Journey Into the Past : the Most Rambunctious, Scandalous, Rapscallion, Splendiferous, Pugnacious, Spectacular, Illustrious, Prodigious, Frolicsome Island on Earth. Fordham Univ Press. pp. 234–236. ISBN 9780823219971. ^ "Coney Island History -Food & Dining". www.westland.net. Retrieved 2017-09-11. ^ "Charles Feltman". Coney Island History Project. 2015-05-22. Retrieved 2017-09-11. ^ "Germany's dog meat market; Consumption of Canines and Horses Is on the Increase" (PDF). The New York Times. June 23, 1907. Retrieved 2008-01-20. ^ "Monthly consular and trade reports". 64 (240–243). United States Bureau of Manufactures, Bureau of Foreign Commerce, Dept. of Commerce; Bureau Of Manufactures, Bureau Of Foreign Commerce; Bureau Of Statistics, Dept. of Commerce and Labor. 1900. Retrieved 2009-09-29. ^ a b Popik 2004:"Hot Dog (Polo Grounds myth & original monograph)"
^ "Hot Dog". Snopes. July 13, 2007. Retrieved 2007-12-13. ^ Zeldes, Leah A. (2010-07-08). "Know your wiener!". Dining Chicago. Chicago's Restaurant & Entertainment Guide, Inc. Retrieved 2010-07-31. ^ "Viskase: About Us". Viskase Companies, Inc. Archived from the original on December 10, 2011. Retrieved 19 December 2011. ^ Cooper, Stacy. "Hot Dogs, Get Your Hot Dogs: all about hot dogs, wieners, franks and sausages". Inmamaskitchen.com. Archived from the original on March 9, 2012. Retrieved 2012-03-05. ^ Bee Wilson (1 May 2018). "Yes, bacon really is killing us". The Guardian. Retrieved 27 December 2018. ^ Does banning hotdogs and bacon make sense? ^ a b New Attack Ad Targets Hot Dogs, Citing Dubious Cancer Risk, Fox News, August 26, 2008. ^ "A Hot Dog Healthier Than Chicken? Could Be..." ClickOnDetroit.com. 2011-03-23. Archived from the original on March 26, 2011. Retrieved 2011-03-27. ^ AICR Statement: Hot Dogs and Cancer Risk Archived 2010-05-03 at the Wayback Machine, American Institute for Cancer Research, July 22, 2009. ^ Attack ad targets hot dogs as cancer risk Archived May 5, 2010, at the Wayback Machine, Canadian Broadcasting Company, August 27, 2008. ^ Hot dog cancer-warning labels sought in lawsuit: Healthy Cleveland, The Plain Dealer, August 29, 2009. Retrieved 2010-07-06. ^ "Listeria and food safety". Health Canada. 2011-06-24. Archived from the original on May 7, 2008. Retrieved 2012-03-05. ^ Harris, Carole Stallings; Baker, Susan P.; Smith, Gary A.; Harris, Richard M. (May 1984). "Childhood Asphyxiation by Food: A National Analysis and Overview". JAMA. 251 (17): 2231–2235. doi:10.1001/jama.251.17.2231. PMID 6708272. Retrieved 6 March 2012. ^ Szabo, Liz (22 February 2010). "Pediatricians seek choke-proof hot dog". USA Today. Retrieved 6 March 2012. ^ "In 2016, consumers spent more than $2.4 billion on hot dogs in U.S. supermarkets". National Hot Dog & Sausage Council. Retrieved 4 July 2018. ^ "7-Eleven About Us .. Fun Facts". 7-eleven.com. Archived from the original on July 3, 2012. ^ "Fire in their Bellies: Sixty Percent of Americans Prefer Hot Dogs Grilled, New Hot Dog Council Poll Data Shows Mustard Takes 'Gold Medal' in Topping Poll". National Hot Dog & Sausage Council; American Meat Institute. 25 May 2005. Archived from the original on 16 June 2005. Retrieved 29 March 2013. ^ Lukas, Paul. "The Big Flavors Of Little Rhode Island." The New York Times. November 13, 2002. ^ "Who's got Canada's best hot dog?". The Globe and Mail. Retrieved 11 June 2015. ^ "Hot dog! Skinner's celebrating 85 years". Winnipeg Sun. Retrieved 11 June 2015. ^ a b c d "The Half Moon Drive In in Lockport gives new meaning to the 'dog' days of summer". Retrieved 11 June 2015. ^ Pierleoni, Allen (1 June 2012). "Sacramento claims record with $145.49 hot dog". The Sacramento Bee. Archived from the original on June 4, 2012. Retrieved 12 June 2012. "Anniversary of Hot Dog, Bun" (PDF). Binghamton (NY) Sunday Press. 1964-11-29. p. 10D. Brady, William (1929-06-11). "Personal Health Service" (PDF). Amsterdam Evening Recorder. p. 5. "Hot Dogs Chain Store Basis". Los Angeles Times. 1925-10-11. p. 18. Immerso, Michael (2002). Coney Island: The People's Playground. New Brunswick, New Jersey: Rutgers University Press. ISBN 978-0-8135-3138-0. Jakle, John A.; Sculle, Keith A. (1999). Fast Food. Baltimore: The Johns Hopkins University Press. ISBN 978-0-8018-6109-3. Lavin, Cheryl (1980-11-24). "Hot dog! 2 mustard moguls who relish their work". The Chicago Tribune. p. E1. Levine, Ed (2005-05-25). "It's All in How the Dog Is Served". The New York Times. McCollough, J. Brady (2006-04-02). "Frankfurter, she wrote: Hot dog shrouded in mystery". The Kansas City Star. McCullough, Edo (2000) . Good Old Coney Island: A Sentimental Journey into the Past. New York: Fordham University Press. ISBN 978-0-8232-1997-1. Schmidt, Gretchen (2003). German Pride: 101 Reasons to Be Proud You're German. New York: Citadel Press. ISBN 978-0-8065-2481-8. Sterngass, Jon (2001). First Resorts: Pursuing Pleasure at Saratoga Springs, Newport & Coney Island. Baltimore: The Johns Hopkins University Press. ISBN 978-0-8018-6586-2. Wilton, David (2004). Word Myths: Debunking Linguistic Urban Legends. Oxford: Oxford University Press. ISBN 978-0-19-517284-3. Zwilling, Leonard (1988-09-27). "Trail of Hot Dog Leads Back to 1880's". The New York Times. p. A34.